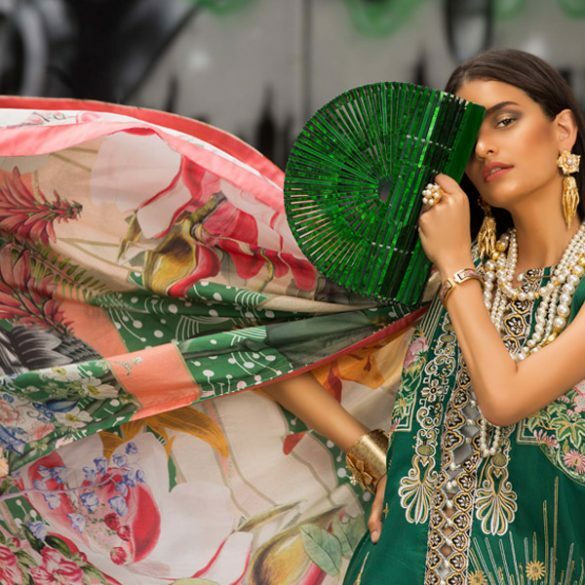 Weekend Obsession: Yasmeen Jiwa Eid Collection! The most popular choice for Eid wear this year happens to be cotton! The cool breathable fabric is a clear winner given the annoying sticky humidity and the fact that the occasion is primarily a day event, it makes sense as well. But just because you’re wearing cotton doesn’t mean you can’t look festive and all dressed up at the same time. Who better to design cotton than the designer who proclaims it as her favorite fabric, choosing to wear it almost exclusively; Yasmeen Jiwa. This Eid she reveals an assortment of colorways and cuts crafted purely out of various cotton fabric textures and silk formals worked on with techniques including exotic shibori tie-dye, woven threadworks, prints, and contemporary embroideries. Asymmetric straight cuts are a prominent feature of her collection and a great move considering the mixed hemline trend wave. They add structure and modern elements and the diagonal line makes the cut wearable with both palazzos and narrow trousers. The grey tilted embroidered neckline above is on our wishlist for its simple but strong elegance factor as is the beautiful garden green and cloudy blue shaded ensemble with shimmering ethnic mirror worked daaman shown in the feature image. Experience a touch of street chic ethnic boho with these printed trousers and crisp white kurta. Summer shades flowing into one another with some sequined glamour atop and softly contrasted colors at the bottom. Classic white Baroche chikan with freshly topped lemon yellow shaded finishing and ink blue embroidery, just lovely. The Yasmeen Jiwa Eid cotton and silk collection priced at Rs 4,800 and above, is now available at her studio located at F/43, Block 4, Clifton, (Off 26th street), Karachi and at Fashion Pakistan Lounge, Dolmen Mall, Clifton, Karachi. Happy weekend shopping! What's in Store? : Deepak Perwani Store Launch at Dolmen Mall Karachi! Interview: Mahrukh Jamot; New Design Captain at Labels!